“Contrary to Harper’s rhetoric, Conservative values are not in fact Canadian values. How could they be when 3 out of 4 eligible voters didn’t even give their support to the Conservatives? But we will only be able to stop Harper’s agenda if people of all ages and from all walks of life engage in creative actions and civil disobediance,” she says. Trashy agrees. And I don’t give a crap if it turns out that one union or movement or another put her up to it. It took guts and she says what many of we progressives believe. We will take back our country. Not a job anymore, but guts. Big f***ing deal. w.e. It’s not like the Cons have shown any class in the Senate or the HoC! And I say to them – if given the opportunity – I would have considered doing the same type of thing. 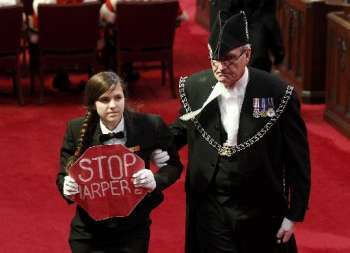 That sign represents what I am going to my damnedest to accomplish over the next 4 years – stopping Harper. Would love to hire someone like that.